Have you ever wondered where to begin instilling the love of writing in your young children? How do you even begin to teach your young learner the love of writing, when they are just beginning to learn to read and write? 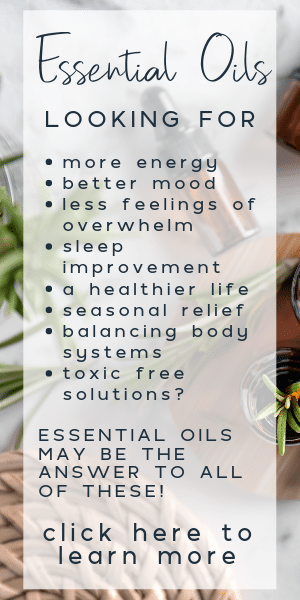 Today I’m sharing a program that makes this possible! I always thought a solid writing program could only be introduced when a child reached upper elementary or middle school. In my head, I associated writing skills with age, and never thought I could begin exposing my six-year-old (1st grader) to writing skills so soon. I mean, they are just learning to read and are still very new at this whole writing thing. At least my six-year-old is. Over the summer, we gained access to an amazing writing program for my first grader. In full disclosure, I received a copy of this program for free and was compensated for my time. This does not in any way affect my opinions. As soon as I dove into this program I just knew that it was giving me the tools to build a wonderful writing foundation in my first grader. Brave Writer gives you the tools you need to create a natural language learning environment for your child. You won’t be sitting down to do lessons like you would traditionally think, instead, you’ll use natural experiences (suggestions and ideas offered such as Poetry Teatime, Art Appreciating, Nature Study, and more) to help grow a love of words, writing, and creative thinking. If you’re thinking this is just going to be a basic writing program – you’re wrong. It’s so much more than that. It is rich in valuable content on how to really cultivate the love of language in your child. The program is broken down into three sections, or parts. You have Language Arts, Oral Practices, and The Writing Program. At this young age of six (1st grade) my daughter is still working on reading and handwriting. She is just in the beginning stages, and that’s okay because the program is designed for the parent to help out. You are naturally planting that seed in them, which will inevitably grow into the love of language and writing. Brave Writer talks about it being a lifestyle. They call it The Brave Writer Lifestyle, and it truly is. Most parents are already doing many of the suggested things in the program, but the program does provide a bit of a guided structure to those who like to know they are heading in the right direction. They are all designed to stimulate the young writer, and each component discusses how to incorporate them into your life. Question guides are offered, which might sound a bit robotic to those who fear super structured curriculum – but I promise you they aren’t. They are great for helping YOU, as the parent, to get the ball running. Sometimes I get stuck and have no clue how to keep the momentum going, so it’s been nice having a guide to reference. It’s really pretty awesome. Brave Writer’s Jot It Down! program provides enough structure to help you feel confident in your school year, but it’s also flexible enough (and encourages flexibility) – so that you don’t feel restricted. After all, the best writing ideas come about when we are free to explore the world around us! As I mentioned, we’re using the Jot It Down! program. It’s designed and developed for 5-8-year-olds. With that said – it’s not dummied down, nor is it overly complex. I found it perfect for my six-year-old, and looking back to when my eldest was seven or eight – this would have worked wonderfully with her too. The writing program is probably the most structured, but you will find a suggested Language Arts schedule for the other sections. Remember – the approach is more of a lifestyle, not a cut-and-dry lesson plan. One of the projects in the writing portion of the program involves fairy tales. We are story lovers in our home and have always provided a literature-rich environment. So this was super fun for us! The lessons offer the parent an oral narration guide – which is a list of questions and suggestions to get your kiddo to express their thoughts and interpretation of the story. You can reword them as you choose, it’s not a strict guide. I would encourage you to allow your little writer to fully express themselves. They may go off on a silly idea of the story, but let them do that! They’re exploring their inner writer dialog and sharing that sweetness. This is a great way to encourage creativity in new ways! MOM TIP: Don’t stress it if you don’t have the suggested Fairy Tale stories in your home library. I went to this site (that links straight to Goldilocks but you will see the others listed on the site too) and found most of them there. I also did a search on YouTube for an illustrated reading of the stories. Very easy to find, like this one from The Princess and the Pea (by the way, this version is really funny – belly laughs and all). We also watched this one for Goldilocks and the Three Bears. For The Princess and the Pea reading, we didn’t find it on that site I referenced above, but I did find it here. If your goal is like mine – to begin to create a unique setting where your child can fully explore their imagination, where they can see their mental pictures of these stories and experiences come to life – then this is a program you want to add to your week! It was beyond exciting to see my child’s face light up as she saw her story come to life! When I see those big brown eyes light up each time we sit down to work on a writing project, my mama-heart swells with joy. I can see her hunger and love for writing grow. I see her eager and ready for whatever her mind can come up with. And, she just loves it when we read back her stories while admiring her illustrations! When we’re done with the Fairy Tale Project, we will bind the pages together and she will have her very own Fairy Tale Book !!! The writing section contains 10 projects, they are designed to be tackled monthly – so in about a school year. Each month you’ll tackle a different writing project. In the Jot It Down! program, due to the young age of the student, the parent will be doing most of the writing, and that’s okay. As your learner continues to develop their writing and reading skills, they will begin to help out in the process. At that point, writing will already be so natural to them since they have experienced it with you during this developmental stage. You are helping them feel confident in exploring their language, their thoughts, their ideas. Through this, they gain confidence and a sense of fearlessness to just write. Maybe that’s why they call the program The Brave Writer. We took a bit longer to do the Fairy Tale Project because, as offered in the guide, they can be stretched out over a few months. Most of the projects are broken down into four-week increments. 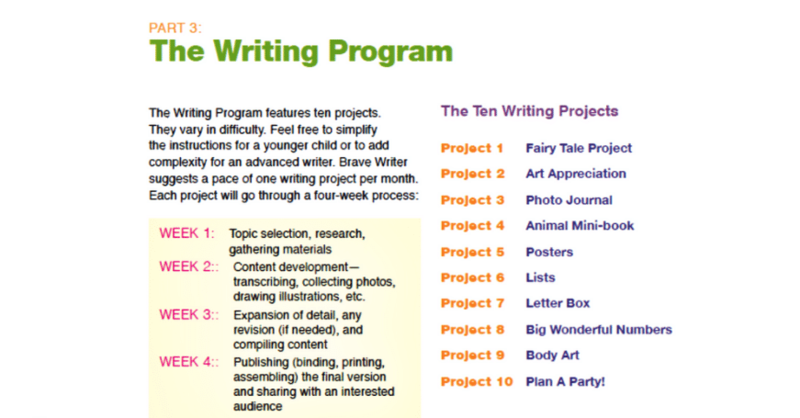 Here’s a snapshot of the writing program overview. I am excited to work our way through the projects, particularly the Art Appreciation one! It will be fun heading to an art museum (which I’ve been dying to do) with my kids. The best part is that I don’t have to do these monthly writing projects in any order. Hello flexibility! Brave Writer’s approach to folding in language arts into your daily life is amazingly refreshing. And that’s coming from someone who thrives on structure! The program is incredibly affordable – but I would pay double that price to have it. It’s totally worth it! Head on over to the Brave Writer Store to grab Jot It Down! and take a look at the program they offer homeschooling parents on how to teach writing – The Writer’s Jungle – a great resource for the homeschooling parent who wants to grow a strong writer within their kiddos.